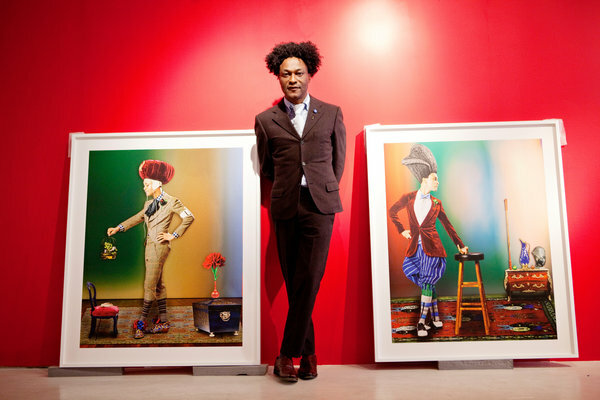 Iké Udé was standing inside the Lelia Heller Gallery in Chelsea in early October during the installation of his show, “Style and Sympathies.” The exhibition, which will run through Nov. 9, was set to open the next day. Many works were in cartons, others leaning against the wall; a few were hung. There was the smell of fresh paint. 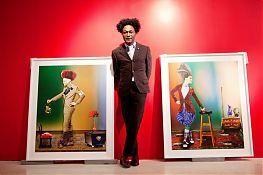 Mr. Udé had been imagining these works since writing the words “Sartorial Anarchy” on the wall of his Chelsea apartment in 2003. A few pieces were included this spring in a show called “Artist/Rebel/Dandy: Men of Fashion” at the Museum of Art Rhode Island School of Design. Mr. Udé, who was born in 1964, was raised in Lagos, Nigeria. Dressing for photographic portraits may be bred in the bone. His family dressed up to have their pictures taken twice a month. He has lived in New York since the 1980s. “I qualify as a New Yorker, if you allow,” he said, his accent and wording showing a trace of the former British colony. The next night, after the show’s opening, there would be a very New York dinner at Bottino, the Chelsea art-world hangout, with Amy Fine Collins, special correspondent for Vanity Fair; Fern Mallis, the former executive director of the Council of Fashion Designers of America; the philanthropist Jean Shafiroff; the model Pat Cleveland, and the model-agent-activist Bethann Hardison among the fashionable attendees. Mr. Udé has been named twice to the Vanity Fair International Best-Dressed List. At the gallery installation, the tall, model-thin artist was wearing a Rive Gauche brownish suit from 1999, by Hedi Slimane. He later admitted he had the jacket shortened. “An improvement on Slimane’s design,” he said with a sly side smile. Ms. Pollock came from the back office and explained the thought process that went into the placements of three photographs across the back wall. “We think this grouping is similar in quality in terms of mood,” she said. She looked at the artist to gauge his reaction. He merely nodded. She gestured toward the front of the gallery to a work showing Mr. Udé in a fantastic tall, orange powdered wig favored by the fashionable macaronis, a movement that was a precursor to dandyism. “We singled out ‘Sartorial Anarchy #5’ because it’s been one of Iké’s best known works to put in the front of the gallery,” Ms. Pollock said. Again, she turned to Mr. Udé. “No, no. I have no opinion,” he said. Michael Watson, the gallery preparator, was energetically opening the pictures and propping them against the wall. He moved on to a white cube where items in the pictures were going to be displayed. On top of it he placed an Uzbek traditional armor hat (circa 19th century); a French fencing mask (1940s); a reproduction of a Western European ruff-collar in white lace and cotton (16th century); and a Lord Byron costume mask, reproduced from an 1835 Thomas Phillips painting of the poet in Albanian dress. Mr. Udé focused on the helmet. He was no longer aloof. “Are you going to leave this like this?” he asked.